NEW Replaced Remote Control for Apple TV MC377LL/A Remote, worked with iPhone MacBook Apple TV 2 3. Do not need any program, only put into new battery can work well!! Warranty 30 days! 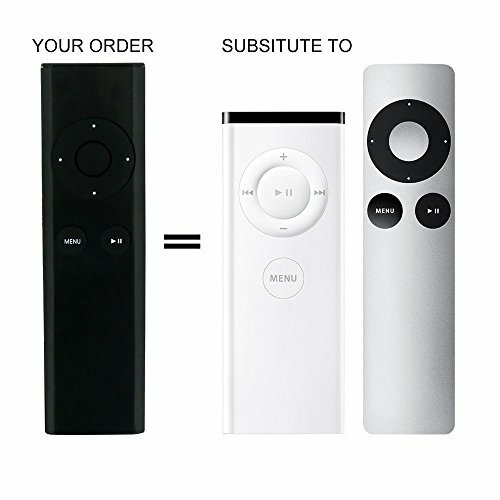 This Remote can operates below models: For Apple TV MC377LL/A Remote , worked with iPhone MacBook Apple TV 2 3. Note: If you are not sure about your model, please feel freely to contact us, we will give you the suggestion. If you have any query, please let us know before give feedback to us, we will help to solve for you, thanks a lot! Working with dry cell (+AAA1.5V and -AAA1.5V). the packing not include battery. 1. unpair Apple TV, press and hold the Menu and Left buttons for 6 seconds to unpair! 2.To pair Apple TV, you need set the SAT of remote to Apple TV first, then press and hold the Menu and Right buttons for 6 seconds to pair! Sometimes you need do as follow:To link to apple TV, press and hold the Menu and Left buttons for 6 seconds.